Denny will be serving breakfast, lunch and dinner all 24 hours of Easter Sunday. 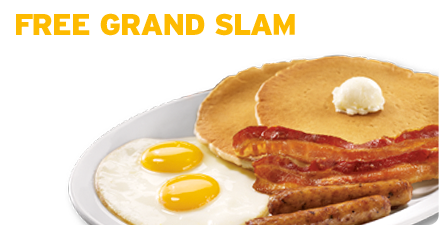 New Super Slampler Deal - 1 Slice French Toast, 2 Pancakes, 2 Bacon, 2 Eggs for $5.99 At participating locations. Price may vary. Buy a $25 gift card, get $5 coupon. $10.00 minimum purchase. A $1.95 shipping and handling fee is applied to each order. Please call 800-733-6697 and ask for the Gift Card Administrator. 15% AARP Discount For a limited time only. AARP offer available at participating Denny's locations. The AARP member offer cannot be combined with other discount offers on the same check. These coupons and deals for Dennys have expired but may still work. $5 OFF $20 or more order. At participating locations. One coupon per table, per visit. Not valid with any other offer or AARP 15% off. $4 All you can eat pancakes all day, every day. Dine in only. At participating locations. Not valid with any other offer. Burgers And Fries Starting At $6.99 At participating locations. Bring your kids on Tuesdays and they eat for free from 4pm to 10pm! Check with your server, as restrictions may apply. Not coupon needed. Per the Denny's website: Harold Butler and Richard Jezak opened a donut stand in 1953 and called it Danny’s Donuts. Butler’s stated promise was “To serve the best cup of coffee, make the best donuts, give the best service, offer the best value and stay open 24 hours a day.” Today that donut stand is a restaurant chain with a slightly different name, over 1,700 locations and a proven reputation for keeping Mr. Butler’s original promise. Denny's is mostly a franchise restaurant today. This has led to problems in some areas, like this from wikipedia: In June 2017, eight Denny's locations in Colorado, including Colorado Springs and Pueblo, abruptly shut down due to a franchise owner failing to pay nearly $200,000 in back taxes as well as over $30,000 in sales tax from the previous year. In addition, several employees claimed there were issues with accounts not being paid, bounced checks and paychecks not arriving on time. As a result of the seizure of the eight Denny's locations by the IRS, numerous employees were left without employment, and claimed that no advanced warning was given regarding the sudden closures. The franchise owner responsible for the closures immediately fled the state of Colorado. Denny's started a rewards program for those at least 18 years old. They occasionally send out Dennys coupons to rewards members. Dennys specials may vary from store to store due to franchise ownership. Airport locations normally do not follow any of these promotions.